Nedderton Park School, on wall in hall. 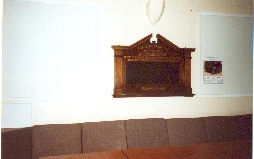 The school is now a private house, but the memorial remains in situ. Unveiled 20th July 1923 by Col. Fail, an old scholar. Plaque about 2 feet 6 inches high x about 4 feet long of metal in wood surround with gable top. There is a beaded edge round about, with pilasters at the sides. The dedication is written in gold elaborate Roman capitals in the gable and top border, and the words "Lest We Forget" written in gold italic lettering along the bottom border. The central panel appears to have been painted light black. The names are painted in black, using Roman capitals, listed in two columns of five, with the eleventh centrally placed at the bottom. Funds assisted by sale of produce from the school grounds. Mr. Redfern, a local man. 1. There was talk of this being removed into St.Cuthbert’s Church at Bedlington, but this did not happen. The Royal British Legion couldn’t house it. It remains in the building, and poppies are placed on November 11th. 2. This can be viewed by appointment. Please ring 07951 160892 to request to see it. Morpeth Herald 27/07/1923 reports unveiling. “Lest we forget” Recessional Rudyard Kipling.